Mont Bleu Cuticle Scissors made in Italy | sharpened in Solingen by Mont Bleu at ETCF Blog. MPN: MB-5181. Hurry! Limited time offer. Offer valid only while supplies last. Perfect scissors for perfect cuticles When it comes to dealing with your cuticles, you need different tools than you would normally use for nails. When it comes to dealing with your cuticles, you need different tools than you would normally use for nails. Don't use regular nail scissors, as they just don't do a good enough job. These European-made cuticle scissors are stylish, long-lasting and beautifully made: a fine quality, they're perfectly designed to nail the task in hand! The curved, sharp blades get rid of the dead skin often found around the base of a nail, and they're ideal for trimming a hangnail. They should be used for this part of your manicure, rather than for cutting the nails themselves. 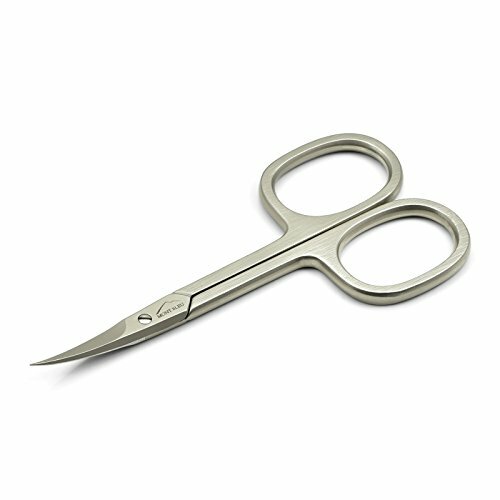 The unique curved design means you cut your cuticles without pulling them, while the fine edge of the scissors makes for precision cutting. The company that made this product has more than eight decades' experience of crafting scissors and other manicure tools of the highest quality. And, because this product is resistant to corrosion, they last a very long time and won't end up rusting away in your manicure bag, unlike some poorer quality scissors. Their length is 9 cm, or 3.5" inches, and you'll also love the brush polished, matt finish on the surface of this product. What's more, the screw holding the two blades together can be adjusted, to make the scissors even more comfortable to hold. Additionally, you'll find that the blades stay as sharp as you need them to do a perfect job on your cuticles, time after time. These scissors are from a brand known for its durability and quality. They are the perfect complement to nail files and nail scissors, and are an essential tool in anyone's manicure kit. Use all the tools together for the perfect, complete manicure.